Kathleen performed on show 347, recorded in October 2017, at age 18. 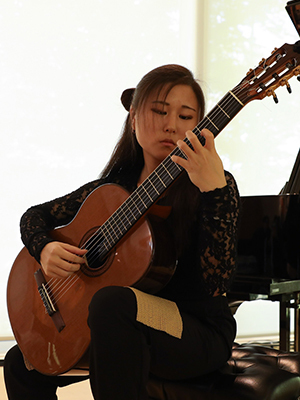 Kathleen (Katie) Mi-Young Cho (guitar), 18, hails from North Potomac, Maryland where she attended Poolesville High School and studied at the Levine School of Music with Maestro Franco Platino. She has recently begun studies at the Peabody Conservatory at Johns Hopkins University with Maestro Manuel Barrueco. Katie had an inspiring moment watching the Baltimore Symphony Orchestra perform Rachmaninoff’s Symphony No. 2 at Strathmore last year, where she realized that true musicians play music to share its beauty and that she desired to do the same. Outside of guitar, Katie enjoys reading, journaling, dining out with her older brother, and learning from Ted Talks on YouTube. Katie’s performance on Show 347 is part of From the Top’s New Music Series, supported in part by the Amphion Foundation.